Jack-in-the-Pulpit (Arisaema) Berries: Nestled at the base of two stout stems each supporting three broadly lanceolet leaves. 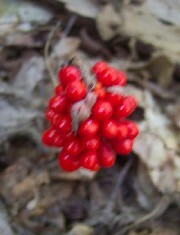 The berries will eventually turn fiery red. Location: Ramsey's Draft Wilderness, GWNF, VA. Ripe berries (The leaves hve died back.). Location: BFT, PA.
Berries of Devil's Walking Stick, AKA Hercule's Club (Aralia spinosa): A tall shrub/short tree which has dangerous thorns at limb junctions and the rest of the bark, hence the name. Fruit in fall. Location: Prince Williams National Forest Park, VA. Photo by Ken Clark. 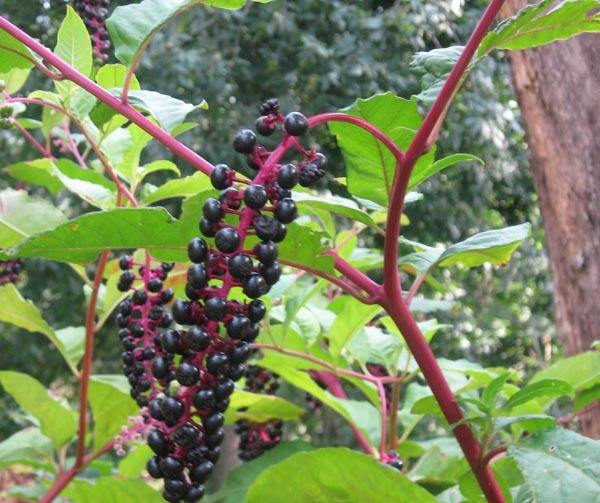 Pokeweed Berries (Phytolacca americana): Commonly called Inkberry. The early colonists used the juice of the berries as a dye. The seeds in the berries are poisonous to mammals. Birds cannot digest them. Photo by Dave Bennick. 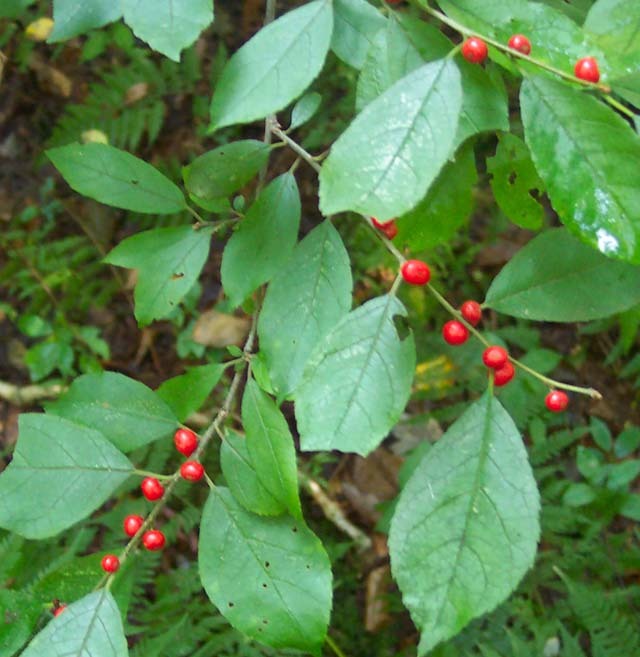 Spicebush (Lindera benzoin) berries: Small yellow flowers atop dense understory in the spring. 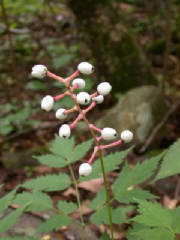 Location: All around SNP, VA.
White Baneberry/Doll's eyes (Actaea pachypoda ): Clusters of fine, white flowers give rise to these in late spring/early summer. Location: SNP, VA. Photo by Ken Clark. Berries of Shadbush, Service Berry (Amelanchier arborea): A small tree and one of the first to bloom in our region. Location" Bear Pen Tr, Tea Creek Backcountry, MNF, WV. 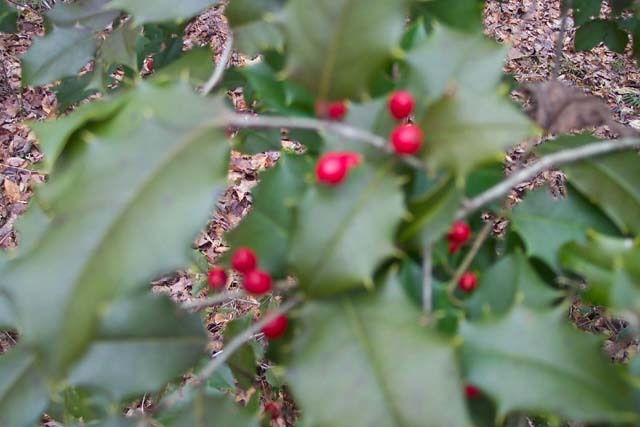 American Holly (Ilex opaca): Evergreen Holly. Male and Female individuals. Males bear fruit in the winter, Can grow to 40 feet. Location: Prince Williams National Forest Park, VA.
Witch's Broom: Actually a disease caused by parasitic aphids that attacks shrubs and trees causing the affected part to grow in a dense clump. 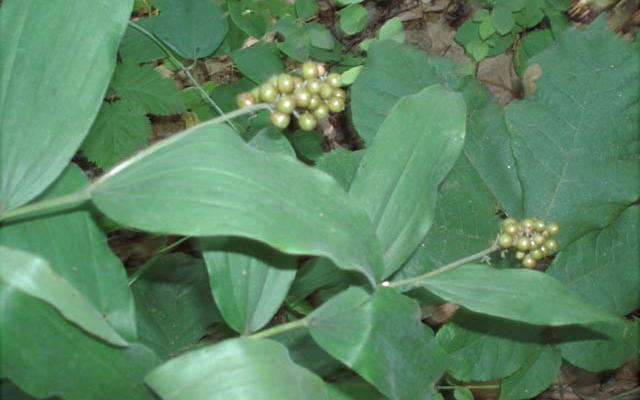 Green berries of the Indian Cucumber Root (Medeola virginiana). 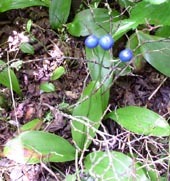 Drooping, yellow flowers give rise to these green berries which eventually turn blue. 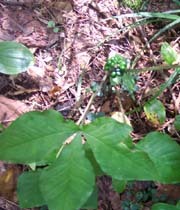 Note the six lanceolete leaves on the same plane below the set of 3 leaves and berries. The tubers are edible raw and taste like ... cucumber. 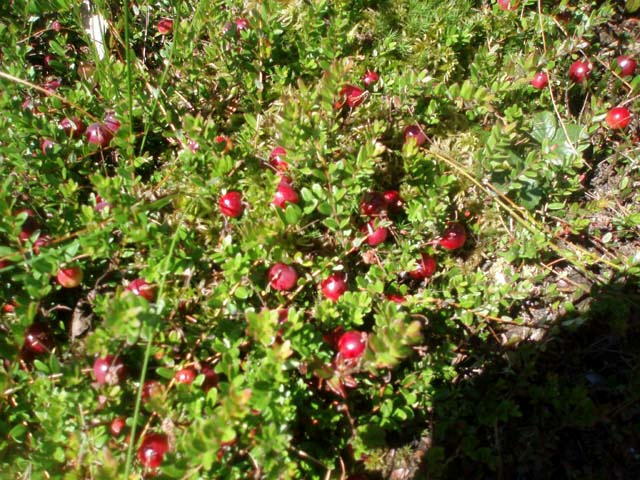 Cranberries (Vaccinium macrocarpon) - Very tart fruit. Loves acidic soil. Location: Dunkenbarger Run, Dolly Sods Wilderness, WV. 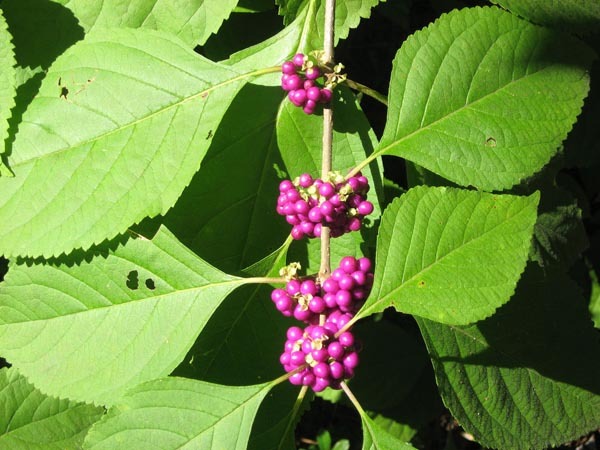 American Beautyberry (Callicarpa americana ): Can reach nine feet in height. A jelly can be made from the berries. Photo by David Bennick. Hearts-a-Bursting/Strawberry Bush (Euonymus americana ): Tall, evergreen shrub. Yellow flowers give rise to strawberry-like fruit which burst open in the fall to reveal 4 smaller fruit. Location: Prince Williams National Forest Park, VA. Photo by Ken Clark. Hobblebush Viburnum, Witch's Hobble (Viburnum lantanoides): White flowers give rise to these berries which eventually turn red. An understory bush that sets new roots when branch ends touch the ground. Location: West Fork of Tea Creek Tr, MNF, WV. 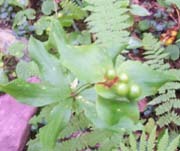 False Solomon's Seal berries (Smilacina racemosa): In the lily family. Stalk of delicate white flowers give rise to these green berries which will become speckled with red before turning translucent ruby red. Location: Wild Oak National Recreation Tr. 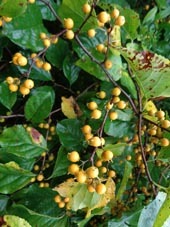 American Bittersweet (Celastrus scandens): Tiny green flowers give rise to brilliant yellow pea-sized berries. These open to reveal red fruit/seeds). 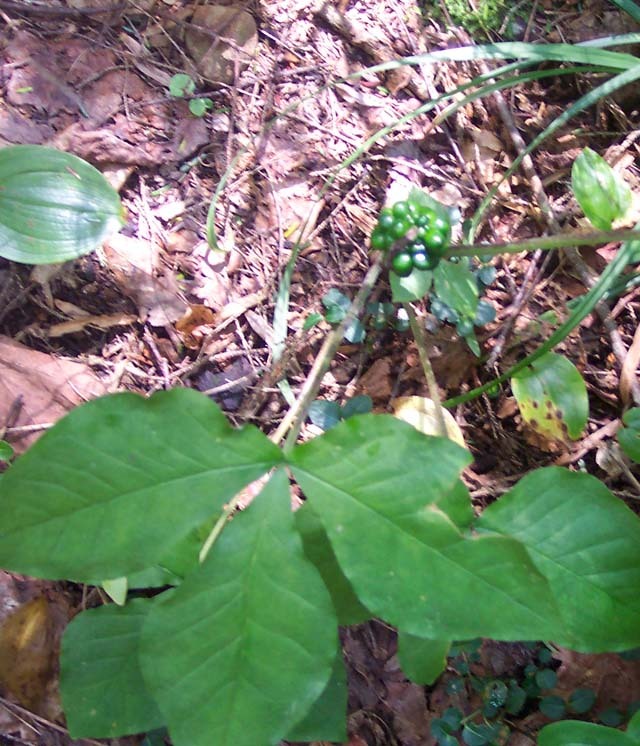 Toadshade (Trillium sessile) berries: Grows in shaddy forests. Location: Gaule Mt. Trail, MNF, WV. Mountain Ash (Sorbus americana) berries: Clusters of small white flowers give rise to these in September/October. Photo by David Bennick. Winterberry Holly (Ilex verticillata): A deciduous Holly. 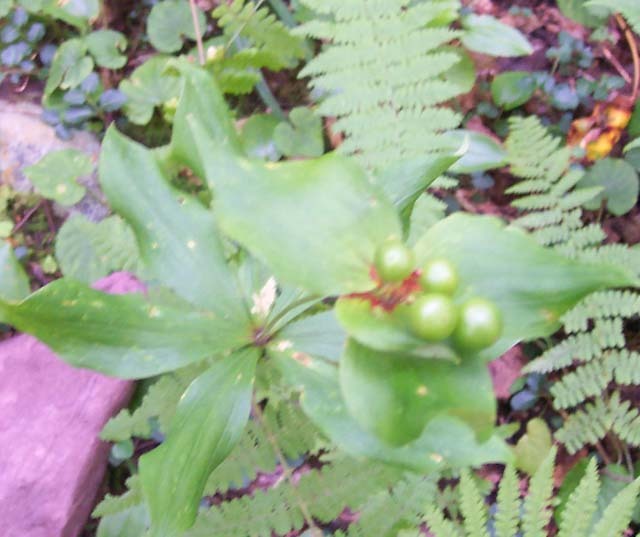 Location: Little North Mt, GWNF, VA.
Berries of Yellow Clintonia or Corn Lily (Clintonia borealis): Photo by Dimitri Tundra.